Many thanks to my testers, couldn't do it without you. Women’s average, covers ears, if you want a shorter cap work fewer repeats at rounds 5-12. 2. Beginning ch 3 counts as a dc. 3. Pull your slipstitches tight, they should almost disappear. 4. 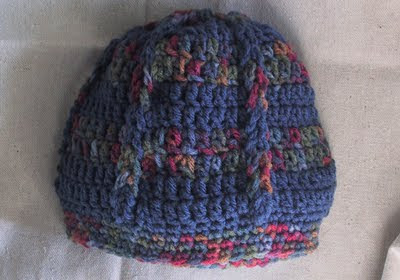 If you are going to use more than one color yarn for your cap, change colors in the joining slipstitch. 5. To change color in a slipstitch, insert hook in stitch and yarn over with new color and pull it through the stitch and the loop on the hook. 6. 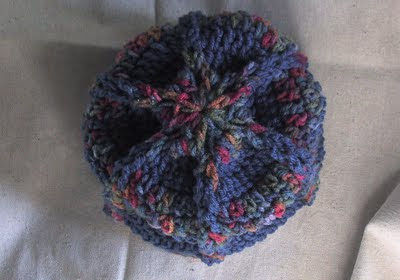 After a couple rounds your cap is going to starting looking like a mutated doily. 7. After chaining up the loops the very top of your cap will probably look slightly wonky. Don’t worry about it, it will look spiffy on the wearer’s head. Chain 5 and join to form a ring. CHAIN LOOPS: Start at top loop of cap and with K hook or fingers pull 2nd loop under and over the 1st loop, pull 3rd loop under and over 2nd loop. Continue pulling the remaining loops under and over the previous loop. Pin the final loop until you are ready you crochet into it on round 13. Very nice hat. I would like to cut and paste the pictures of the hat into my document, but it will not allow me to do so. Help!! Perhaps something has changed on your computer. I like this hat! I took me about an hour and a half to complete, very simple and definitely keep ones head warm! I tink I'm going to try a scarf in this pattern. Love this hat. I thought it would be hard to do the loop weave but finally got the hang of it. Giving out as gifts. Thank you for designing this cute hat.